Dexter Are Fire Department Chief Loren Yates didn’t sleep, didn’t go home and didn’t stop working for more than a day after Thursday’s tornado hit the village. 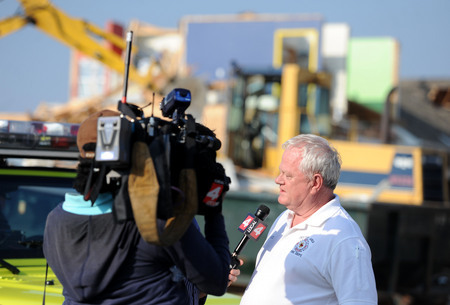 Loren Yates, during a television interview Friday afternoon about 23 hours after the tornado touched down in Dexter. Working the biggest natural disaster of his career, Yates had a tempered joy in his voice Friday afternoon when speaking about the response from his firefighters and the help they received from all around Washtenaw County. While saddened for the residents whose homes were lost in the storm, Yates said the coordinated response by at least seven fire departments, response teams from Washtenaw County and police went perfectly. Yates said firefighters originally responded to Dexter Township when the storm hit, even before getting a call reporting major damage in the village. He said there was hardly a thought given to the conditions outside the trucks — heavy wind, rain and hail, not to mention the EF-3 tornado — when going toward the hardest hit areas. Yates said the department had the tough job of balancing the safety of firefighters responding to the homes and how badly residents in the affected homes needed help. He said trees and power lines were coming down as they drove, but concerns about trapped people and possible fires came up trump. First responders from every department went to each of the 100 homes that were damaged throughout the village, checking to see if there was anyone inside and doing their best to account for each resident, Yates said. The mood among the crews brightened as they went to each home and realized that — unbelievably, miraculously, luckily — no one was hurt, he said. “Every time we went to one, we knew we had a bunch more to go to and we were just grateful when we checked one dwelling (and no one was hurt),” Yates said. It wasn’t until 2 a.m. Friday that the last damaged house was checked and cleared. And then, the clean up began in earnest. AnnArbor.com reached Yates as he was monitoring the situation in the badly damaged Huron Farms neighborhood. It was a sobering scene, with homeowners picking through what remained of their homes and salvaging as many of their belongings as they could. Around him were workers from insurance companies assessing damage, construction crews boarding up houses that were savable, police and sheriff's deputies coordinating who was allowed in and out and firefighters from different departments still helping out. Yates said it was chaos, but an organized chaos. The coordinated response and rescue effort went so well it was like a drill, he said. The sheer amount of personnel who were assisting Dexter firefighters meant some of the men could go home and get some sleep or, in the case of the on-call firefighters, attend to other obligations, Yates said. He gave those crews from other fire departments, Huron Valley Ambulance, the Washtenaw County Sheriff’s Office and Michigan State Police and other county groups all the credit he could for their help. However, there were quite a few firefighters who were working around the clock with their chief. Yates said he planned to go home when it got dark Friday night to finally go to bed. It would be easier to sleep knowing that only houses and trees in Dexter were destroyed, he said. “In the end, it all worked out well,” he said. Mon, Mar 19, 2012 : 5:56 p.m.
Nicely done Dexter Fire Department, and Washtenaw County Tech Rescue. Mon, Mar 19, 2012 : 4:51 p.m. Thank you for our wonderful Fire Department. Our house was damaged (Dexter Pinckney Rd) and throughout the evening 3 different sets of Firefighters knocked on our door to check on us. They offered any help that we needed. Thank you for all the first responders! Mon, Mar 19, 2012 : 3:33 a.m.
As for the Sheriffs dept, try again. Next time there is a tragedy, 4 hours AFTER, try to have a plan. Village residents were not allowed into town to check on their homes or their families! When we tried to get in we were turned away. When I asked what I was supposed to do, a state trooper told me &quot;I dont know, find another place to stay tonight&quot;! When I called 911 to find out when I could get into town and what I was supposed to do, guess the answer the dispatcher gave me??? You got it, &quot;I dont know&quot;! Great leadership! At 10pm when my cell phone finally started working again, I got the 3 frantic messages from my daughter who was in teers because she couldnt get home and was turned back at every check point she came to. All because deputies were to lazy to check ID to confirm we really did live in town and were not just site seeing! Dexter Fire Dept and Loren Yates, YOU GUYS DID AND CONTINUE TO DO AN AWESOME JOB!!!! THANK YOU !! Sat, Mar 17, 2012 : 11:04 p.m. Thank God for the first-responders...the Dexter Fire Department, the awesome Sheriff's Dept.., and all of those other heroes who came to Dexter's aid from surrounding areas. Dexter LOVES you! Sat, Mar 17, 2012 : 6:49 p.m. Sat, Mar 17, 2012 : 8:06 p.m. Yes, she does. I didn't say she shouldn't say what she believes, yet you seem to be saying that *I* should not say what I believe. If I thought Elaine were a survivor, I wouldn't have said anything, out of respect, but since there is nothing to suggest that she was directly affected, one opinion is as good as another. And yes, it annoys me to suggest that God goes around plucking some people out of the path of destruction and not others. I find no comfort in that, at all. Sat, Mar 17, 2012 : 4:53 p.m.
@Susan - take a break, eh! Elaine is simply expressing gratitude and you're tromping all over her. Let's keep our discussion civil. If you want to believe in random luck, you're entitled to. I will thank God. Sat, Mar 17, 2012 : 5:24 p.m. I'm simply taking issue with this concept that God plays favorites. People who lost their lives elsewhere are not victims of God's lack of caring; they are victims of a random weather occurrence. Suggesting that God looks out for some more than others is not reason for thanks, IMO. Seems more than a bit unfair for a deity to play favorites. That's not the view of God that I would advocate. Sat, Mar 17, 2012 : 3:52 p.m.
To Elaine Owsly: So by your reasoning, God is really ticked off at people in Illinois and Kansas and so on? If &quot;God is watching over Dexter&quot; then what was he doing last week when twisters hit the midwest and killed people? If he were really looking out for Dexter, wouldn't it have been easier just to break up the tornado in the first place? I'm sure the people who lost their homes are wondering &quot;why us.&quot; When things go right, God gets credit. When things go wrong, there's suddenly a response like &quot;ours is not to question why&quot; or whatever. It was a TORNADO, not a divine sign. Oh, yes, I know - I &quot;just don't understand.&quot; Yes, I do actually. It's just random luck that nobody was killed. Mon, Mar 19, 2012 : 3:25 a.m.
Well, as for me when my house was untouched and my neighbors wasn't, I dint think God dislikes my neighbor, I think he was simply looking out for me and someone else needed to have damage to draw all of our communtity together. Ask the woman who was 3 months pregnant who hid in a master bedroom closet with her husband and 2 kids because they didnt have a basement. When the storm was over, she opened the closet door the entire house was gone weith the exception of the master bedroom and closet. I'm sure she thinks someone (God) was looking out for her! Who has the right to argue that with her? I don't believe God was ticked off at anyone, either. that's my point: God doesn't play favorites by watching over some people in a disaster while ignoring others. God does not save or not save tornadoes in order to indicate who he does or doesn't like, or who he is or isn't watching over. People are dead in Illinois and not in Dexter because of pure chance. The whole thing has nothing to do with God one way or the other. It's just weather. You assumed that I have &quot;nothing to believe in.&quot; You don't know whether I do or don't believe in God; all you know is that I don't believe that God intervenes to save some people in tornadoes and not other people. Sat, Mar 17, 2012 : 6:28 p.m.
No Susan, that's your interpretation. I'm sorry you feel that way. It's sad not to have anything to believe in. I don't believe that God was ticked off at anyone. These types of well-coordinated responses don't just &quot;happen&quot;'; they are the result of serious, long-term planning, organization and training. Kudos to all the professionals involved for their support and dedication, and to the people of Dexter and the surrounding area who are a shining example of resilience and community spirit. Sat, Mar 17, 2012 : 1:02 p.m.
As a resident of Huron Farms, I must commend all of the firefighters, police, Red Cross volunteers and many more who were there right away to check on us. It was reassuring to know that even in the chaos that was our neighborhood after the storm, no one was going to be forgotten. They were, and have continued to be, organized and thoughtful in their care of this situation. Sat, Mar 17, 2012 : 12:39 p.m.
Local churches should pay special attention to this event this Sunday and the blessing that there were no deaths or injuries. Stuff is just stuff, but surely God was watching over Dexter Thursday evening and keeping her people safe. Sat, Mar 17, 2012 : 12:57 p.m. So... when people are killed in a tornado, God is NOT watching over them? Got it.